We are excited that you have decided to shop at Decobot. We put our hearts behind every product we make and are honored to sell them to you. To give you the best shopping experience, we want to educate you on some conditions that apply to your purchase, so that you can make your purchase with full confidence. We accept payments only through Stripe via Squarespace Commerce. Stripe accepts all major credit cards without the need to sign up or login for an account. We believe that you will be fully satisfied with your purchase. We also understand that things happen and you may change your mind about your purchase. Due to the very collectible nature of our products, you may only return an item that is sealed and unopened in it’s original packaging. Once the wrapping of the packaging is broken or torn, it is no longer eligible for return. To return an item, you must contact us by filling out the (support form) within 14 days of receiving the item(s). You must then ship the item(s) back to the return address provided on the original packing slip at your cost. Once the item(s) is received and inspected by Decobot, we will issue your refund for the item plus tax. Shipping costs will not be refunded. All Art Print sales are final. This product category is not eligible for any returns or exchanges unless it arrives to you damaged. The only other time a product is eligible for a return, is in the event that the product arrives to you damaged. In this event, we will send you a replacement product at no additional cost to you. The replacement package will include a return label for the original damaged product. You must then send us the original damaged product within 14 days of receiving the replacement. If we do not receive the original within 21 days of you receiving the replacement, we will charge your original payment method for the cost of the replacement item plus shipping costs of the replacement and the included shipping label. We cannot perform exchanges at Decobot. To Exchange a product, you must send us the original in accordance to our return policy. Upon receiving the item(s), we will process your refund. Then you may place a new order from our store. You may cancel an order within the first 18 hours of placing it. This is our standard holding time to allow for proper processing and order preparation. To cancel an order, you must contact us within this 18 hour window by filling out the (support form). We will then issue you a full refund. If you are past this window, you must wait for the order to arrive and follow our Return Instructions (http://decobot.co/returns). By placing an order at Decobot you understand that it does not guarantee that we will process your order. We reserve the right to reject orders placed at our store for any reason. In the event of a service denial, we will refund you the full amount. Shipping Dates shown on Pre-Order items are estimates and are not guaranteed to ship on that date. You may cancel your order at any time between placing your order and receiving the final shipping message. The final shipping message will arrive to you 2 days from its ship date to inform you on the impending shipment. You then have the opportunity to Cancel your order within 18 hours from receiving the message. See “Cancelling Orders” for more on cancelling your Pre-Order. One of the coolest parts of shopping online is finding special promotions, deals, and discounts. We like to offer these to you from time to time. by placing an order at Decobot you understand that promotional items are limited and may not be available at the time of your purchase. In the event that we are unable to uphold a promotions, special deals, and discounts, you will be notified and will have a chance to cancel you order for a full refund. 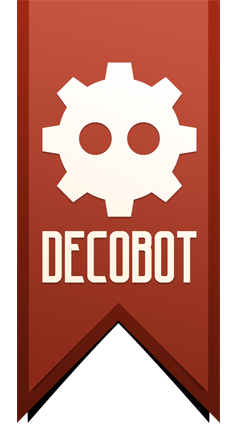 All promotions, special deals, and discounts are upheld at the discretion of Decobot. In the event of a rejected promotions, special deals, or discount, you will be notified and will have a chance to cancel your order for a full refund. Promotional items do not quality for any warranties. If a warranty issue occurs with a promotional item, contact us via email (support@decobot.co) and we will do our best to come to solution. All shipping times posted online are estimates. We do not guarantee the accuracy of the dates posted. In the event that a shipment will be delayed, you will be notified and will have a chance to cancel your order for a full refund. We guarantee that our products are crafted with the highest of quality. All of our products are also considered “collectible” and can be fragile. Please follow our Care for Collectibles page for tips on preserving your purchased products. All of our products have a warranty of 90 days from receiving them against poor quality of craftsmanship. As the majority of our products are constructed of paper, cosmetic damage and abuse do not qualify for this warranty and are considered normal wear and tear. Please contact us via email (sales@decobot.co) if a warrant issue occurs. We will replace the item or affected components in accordance to our DOA procedures above. In the case of warranty issue ranging in the time between 15 and 90 days from purchase, you must pay for the cost of shipping the product back to us for inspection first. Then a replacement item or component(s) will be shipped out at no additional cost to you. All products, logos, artwork, titles, designs, packaging, and other included items are Trademarks of Decobot and are protected by registered Copyright. The owner of all assets is Decobot. Decobot products may be sold by various third-parties. Please refer below for the list of our official authorized resellers. If a vendor does not appear in the list below, they have not been permitted by Decobot to resell our items. We advise against purchasing our products from these entities. Our sales policies do not apply to Decobot Products purchased from any entity other than Decobot or Ali Showkati. If there is an issue with an order placed at an authorized reseller please contact that retailer directly. Decobot cannot gurantee the quality of service issued by any indirect vendors. Products that are purchased by an official reseller is eligible for the Decobot 90 Day warranty. To claim a warranty issue, you must be able to provide proof of original purchase. You understand that that our Sales Policies may change at any time without notice. All information taken by Decobot is for the sole purpose of providing you with the best and most secure shopping experience. Decobot will never sell or share any of your provided information to any other entities including third party vendors.